Imagine a future spacecraft following New Horizons' trailblazing path to Pluto, but instead of flying past its target - as New Horizons needed to do to explore Pluto and the Kuiper Belt beyond - the next visitor touches down near the tall mountains on the frozen icy, plains of Pluto's heart. 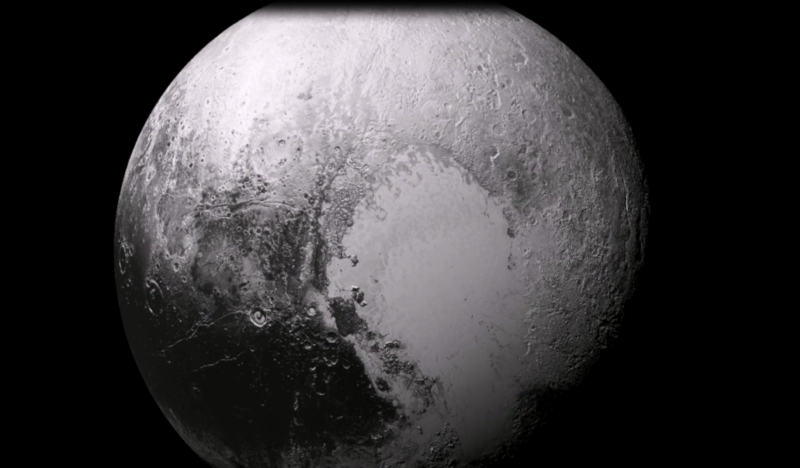 A video produced by New Horizons scientists that offers that very perspective. Made from more than 100 New Horizons images taken over six weeks of approach and close flyby, the video offers a trip in to Pluto - starting with a distant spacecraft's-eye view of Pluto and its largest moon, Charon, to an eventual ride in for a "landing" on the shoreline of Pluto's informally named Sputnik Planum. The video shows what it would be like to ride aboard an approaching spacecraft and see Pluto grow from a "dot" to become a world, and then to swoop down over Pluto's spectacular terrains. After a 9.5-year voyage covering more than three billion miles, New Horizons flew through the Pluto system on July 14, 2015, coming within 7,800 miles (12,500 kilometers) of Pluto itself. Carrying powerful telescopic cameras that could spot features smaller than a football field, New Horizons has sent back hundreds of images of Pluto and its moons that show how dynamic and fascinating their surfaces are - and what great targets they'd make for follow-up mission one day.